Back in May I replaced my 21” wheels with a new set of 19” wheels. I am very happy with the decision and really do not miss the 21” or their related headaches. Immediately after the replacement, my car began to squeak, and squeak really loudly. The noise was most noticeable when turning at very low speeds. The worst of the noise sounded like furniture or house settling noises, but quite loud and easy to reproduce. The sound was most noticeable in the morning when the air was colder than mid day. When I went to the service center, an advisor verified the noises along with some bystanders. “verified customer concern. Creaking, popping, and clicking noise coming from the front suspension area when turning the steering wheel left to right or right to left”. Tesla’s solution was to replace two bolts and two friction shims. Unfortunately, when I picked up the car and even before driving out of the parking lot, I could reproduce the noise. Instead of taking the car home, I left it at Tesla. All the parts that were replaced or tightened had to do with the suspension in the car except for the shield, which protects the battery. I strongly suspect that the squeaking was a result of the replacement of the tires and somehow the suspension got a little out of whack. Since this incident I have driven about 3,000 miles with no more noise. After driving my Model S for four years on 21” wheels, I decided to downgrade the car to 19” wheels. The decision process took a while, and the saga is a long one. A few months ago I noticed my tire had yet another leak. The leak was very small and only required pumping up the air about every other week at the most. Having so much experience with tires, I was not worried about this leak and had either used my electric pump, that I always have in the trunk, or the manual floor mounted bike pump in the garage to add more air. I had intended to go to my very local service station / auto repair place and have them look at my tire at some point. I suspected I had a nail in the tire and that the tire could be repaired. The tires were not very new, so I was hoping I could delay replacing the tire, as that likely meant I needed to replace not just one tire but two. When the tread is quite low on the tires, they do not want you to drive around with a set (either the front or the rear), where one tire has all its tread and the other is almost worn out. I suspect this discrepancy could cause excess or unaligned tire wear. Only an encounter with a Tesla service person on another matter changed the story. I earlier reported that my 12 Volt battery had died and needed service. The local service center now has one mechanic that goes to your location to repair batteries and tires. As the ever curious Tesla owner, I watched him change the battery, and talked to him about various Tesla topics. Somewhere during the conversation, I mentioned that I had a leak in one of my tires. The service guy offered to look at my tire for no cost. I had not planned on having Tesla address this leak, but I since it was free and he was already in my garage, I happily agreed. The mobile service guy brought out his jack, and in very little time had the wheel off the car. No nail was visible, but to my surprise I had a problem I have never seen on any car I have ever owned, my rim was cracked! The rim was visibly cracked with a hairline fracture, and to confirm he added water and you could see the air bubbles. He explained that if you hit a pothole “just so”, you can crack your rim. He said I was safe to continue to drive the car with the wheels as long as I slowed down for any pot holes. Since I have been plagued by tire issues, I watch for potholes constantly. I know where the road is worn out locally and steer out of my way to protect my tires. I have been driving in this manner for 50,000 miles. Luckily the town I live in has a fair amount of revenue stream and our roads are pristine. I do remember however driving in the East Bay awhile ago and remembering a badly beat up stretch of payment on 580. One fun grammatical note: In Northern California, freeways are referred to by numbers not their names and are never preceded by the word “the”; in Southern California the naming convention is the reverse, which sounds so strange to our ears. On 580, I distinctly remembered that I had avoided as much as I can any issues in the road pavement, but I know I did hit one pothole with the wheel in question. I now really did not know what to do. I knew not only I couldn’t just repair one tire, I had to buy a new rim also, and they cost $500! I really didn’t want to do either, and this let me open up my thoughts to do something completely different. fast and hugging every curve. I had initially configured the Model S to have the 19” wheels, but at the last minute a friend convinced me to go with the 21” primarily because they looked so much better. I was just not particularly fond of look of the original 19” wheels, and Tesla no longer sells them to new buyers. Over the years I have talked to many different people associated with Tesla about my wheels. I am not a particularly talkative person, but I can strike up a conversation with strangers with no qualms, and ask many detailed questions on an interesting subject. My fellow blogger from the East Coast has been very happy with his car and wheels. He got 50,000 miles on a set of tires! That amount of mileage was and still is only something I can dream about. Tesla has treated me very well during this experience and have done a lot of monitoring of my alignment. I managed to drive almost 23,000 miles on my third set of tires. My latest set of tires gave me at least 16,000 miles, which is respectable. All four wheels had a fair to a considerable amount of curb rash. I haven’t hit a curb in a couple of years, but it took a while to get used to the very wide car. I was happy with what Tesla and I achieved in terms of tire mileage, but I was tired of how susceptible the tires were to other objects such as small potholes. I was in a way tired of “living in fear” and having to watch the road excessively. After the deluge of rain we received in California this winter, we have a lot of potholes in the state in general. My current mileage was about 65,000. I definitely had to replace one rim, and my front two tires were due to be replaced very soon, and the rears in short order. Tesla provided the exact tread depth measurements, which are reported below. I have extensively worked with Tesla over the last few years on my toe wear issues. Tesla service has done really all they can to fix and monitor my extensive toe wear. I am very glad my toe wear has improved enough that I can replace my tires closer to 20,000 miles instead of 12,500 miles. But when looking at the wear report, the Tesla report still shows toe wear. When speaking to the first service person who was not my regular contact, I was told “you must have hit a pothole”. No, I did not hit four potholes on all four wheels! The car still wears out the toe more than it should. While the car sat in the shop waiting for a battery fix, I contemplated the numbers. I had a choice. Instead of sinking more money into a set of wheels that would never be very durable or long lasting for the Model S, I could fork out the cash to get the new 19” rims ($300 each) and tires ($180 each) for $480 each before tax and installation, or I could buy two 21” tires ($375 each), a new rim ($500) and in a few months buy two more new 21” tires. Although I didn’t need to replace the back tires immediately, I would within 6 months. So for the same price, I could get longer lasting lower maintenance tires. The numbers are using Tesla default pricing and there are other options like buying tires through 3rd party places, but these calculations are listed here for simplicity. So even in the short term, there was no real financial reason to stick with the 21s, and in the long run a very large savings. I decided to go with the 19” rims. I am tired of the hassle of these performance tires. I had to wait a while because the service center only had two rims in stock, and needed to get the parts shipped in from the warehouse in Lathrop, California. I also had another way to make a little money. I could sell the wheels! Tesla disposed of the wheel with the cracked rim, but I brought home the other three. I am not much of a seller and generally just donate things, but this was more than a few dollars worth of value. I first tried the Tesla Motors Forum and got some interest, but I soon got tired of looking at the wheels, even if the garage has a lot of space. Using Craigslist, I got interest in the wheels immediately. I am not much of a negotiator, and just pretty much took the first reasonable offer. When selling on Craigslist you need to include photos of both the front of the wheels and the tire tread patterns. Within a couple of hours, I got several questions and responses, and quickly sold the wheels. The buyer was a Model X driver who was planning to take the wheels and powder coat them to a new color. He also said that there was a 22” tire that worked with these rims. I sold all three of them for $450, so in the end I saved money buy buying new rims even in the short term. The Tesla app for some reason still did not think I had any wheels on it. The car recognizes the wheels as 19” as the picture had changed on the dashboard. I knew the tire sensors were still talking to the car, so I knew I would get any low pressure warnings. But the app picture was still a little ghostly. I ended up pointing this issue out to the service manager, and he fixed it by reprogramming the computer on the car. He had never seen this issue before. Right when the process was done my car started to squeak. The Model S is currently in service to fix this strange noise that occurred right after the wheels were installed and did not go away. I’ll report on that when I get the car back. I am very glad I made this decision. With the new style or rims, I don’t miss the look of the 21s at all, and I will save so much money and hassle in the long run. I have only noticed a very minor difference when driving, but I have not really gone anywhere recently that is particularly fun to drive. Classic Teslas like mine do not have the hardware that enables the autopilot features. The new software release that all cars received last Friday works for both the Classic Teslas and the ones with the autopilot hardware, which costs $2,500. This release has a few significant highlights and unfortunately a couple of lowlights for Classic Cars such as mine. 1. The look and feel has changed in several small ways. Some of the fonts and style has changed a little bit with the current fashionable flat 2-D icons. When Apple first released their 2-D icons, I missed the older ones, but I largely think this is just a current style trend that will eventually change again. 2. For long road trips, the information on the dashboard for energy usage is much clearer. Now instead of looking at a strange screen with Trip A and Trip B monitors, you are looking at the information since the last time you started the car on top, and since your last charge below. On long road trips when I was running dangerously low on energy, I would always bring up the Trip screen to get this information since last charge. The Trip A and B information is still available on the 17” screen if people plan their energy use that way. I like this change because I can monitor how much energy I have used since my last charge very succinctly. I like the kWh usage number and I can easily mentally compare that to my 85kWh battery and compare my Wh/mi usage to the 300 Wh/mile standard. 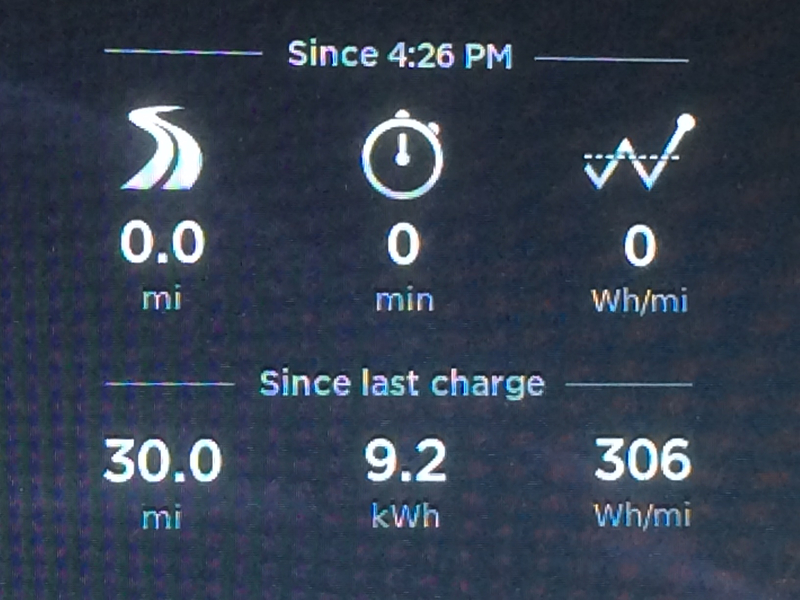 Here in the hills of California, I never average as low as 300 Wh/mile. Only on some very flat freeways can the average be maintained at that low level. 2. Tesla has finally found a solution to my curb rash! 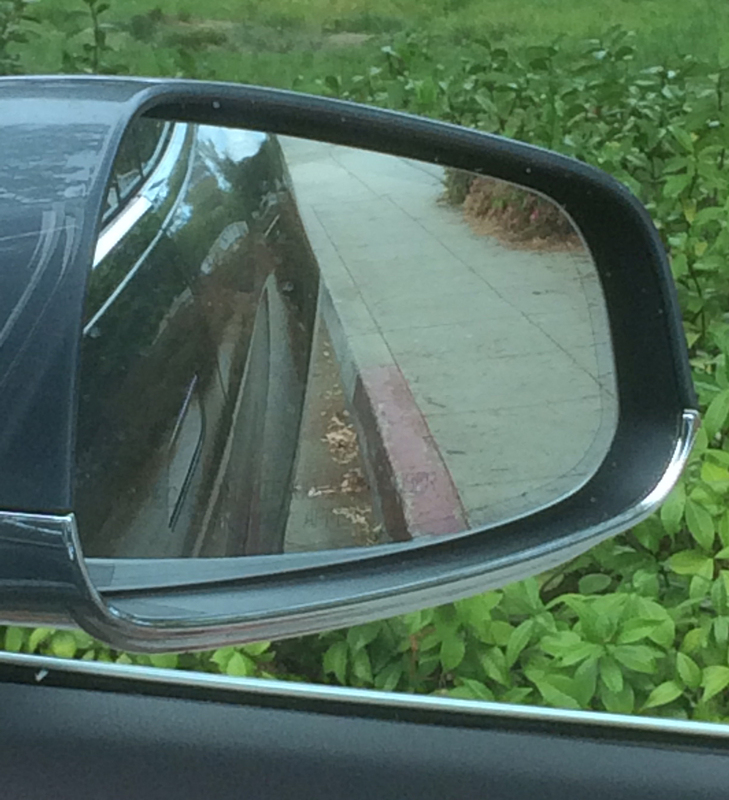 Now the rear view mirrors adjust downwards while backing up. I have only tried using this feature once but now I imagine I can parallel park much nicer even without auto-pilot. Of course, I could have done that manually in the past, but I couldn’t imagine messing with my mirrors every time before and after parallel parking. I’m really excited about this feature because for some reason I’ve never been a great parallel parker. In my entire life I just have never lived anywhere where I parked parallel with any frequency. After visiting so many superchargers, I’m really good at backing up into tight spaces though. 3. The center of the dash has grown and changed to accommodate an area for the autopilot in the middle of the speedometer. For those without autopilot the area is a bit excessive. The car will have indication lights such as when it is braking as in the picture, but typically this information does not change much and can be a bit annoying. Owners with red cars have reported they cannot really see the red indicator lights as it blends too much with their car color on the display. To make space for the larger center display, the battery level was moved to the left and the date, time and temperature removed from the standard dash set up. You can see the time at the far upper right of the 17” screen, and the date through the calendar app. To appease those of us who may want to have an easier glance at the time, they added a new clock widget. The response to the clocks widget is that it is almost universally esthetically displeasing. And with all of that space, why can’t the date and day of the week also be listed? 4. Tesla added a tiny lock and unlock button on the top row of the 17” screen. I like this improvement because it took a while to fiddle around the 17” screen to unlock the doors for someone who was trying to get into the car. They moved the outside temperature reading up here too along with a new button for bringing up the charge screen. I think the temperature needs to go back to the dash permanently. I am a bit obsessive about the outside temperature. I adjust the inside temperature control a lot depending upon the outside temperature and whether or not it is sunny. This fall has been so warm here in California. Today is the first day of the year that even feels like fall not summer so I’ve been watching the temperature this year a bit obsessively. The new charge button brings up the charge screen, which to me is a bit strange. I am always fiddling a bit to find the unlock charge port button more than anything else on that screen. I’d prefer that this lightning bolt just unlocked the charge port. The release also includes a few other minor changes on the dash board that I will not mention such as a full screen control of the media player. There are also some efficiency improvements but I have not driven the car much yet to notice any differences. Newer cars also get a full four wheel tire pressure monitoring sensors that will report on each four tires. My car’s vintage is unfortunately too old. I don’t know if there are any bug fixes to the bug challenged trip planner. All in all, I think 7.0 is an improvement even with a few trivial mistakes on the UI. As my regular blog readers know, I have had a torrent of problems with my tires. I have had problems with excessive tire wear (which I hope to report an update on soon), but also just more mundane problems. My wheels have a fair amount of curb rash particularly the right rear tire due to the tire’s profile and the large size of the Model S. But I have not scraped a curb in a long time and I don’t fret over a few scratches. My more mundane problem with this right rear tire is that I had a nail in the tire earlier this year. I had the nail torn out and a plug put into the tire by my local mechanic. The tire worked fine for several thousand miles. Then in a bit of a rush, I scraped the sidewall of the tire. Then a thousand miles later, the plug began to have a slow leak. 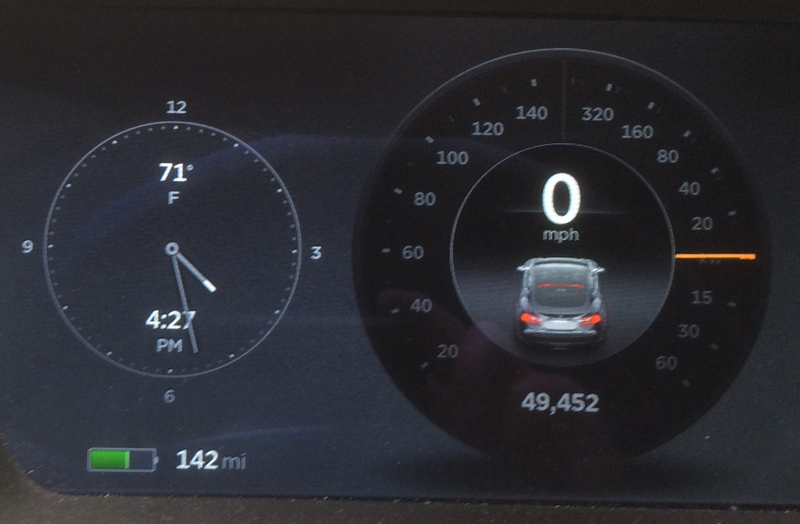 The Model S TPMS system does a good job warning you when a tire is less than 30-32psi. I consistently will get a warning when the tire is around that threshold. On the Model S, the software does not tell you which tire is leaking. Ironically the TPMS on the Roadster did tell you which tire leaked! I have four tires of the same vintage with significant wear, so replacing one tire would definitely require replacing two tires. Tires are not free and they also use resources in manufacturing and shipping. So I decided to delay the replacement by pumping air in the tire. I did not look at a second repair of the plug. The first repair cost me $47.60. I live in an expensive neighborhood with an extremely reliable mechanic. I could likely find another shop that may be able to do a second patch for less money, but I decided to not investigate that option. The first method is to drive to a conventional gas station. I only tried this method once as I was out and about when the tire pressure warning light indicated. 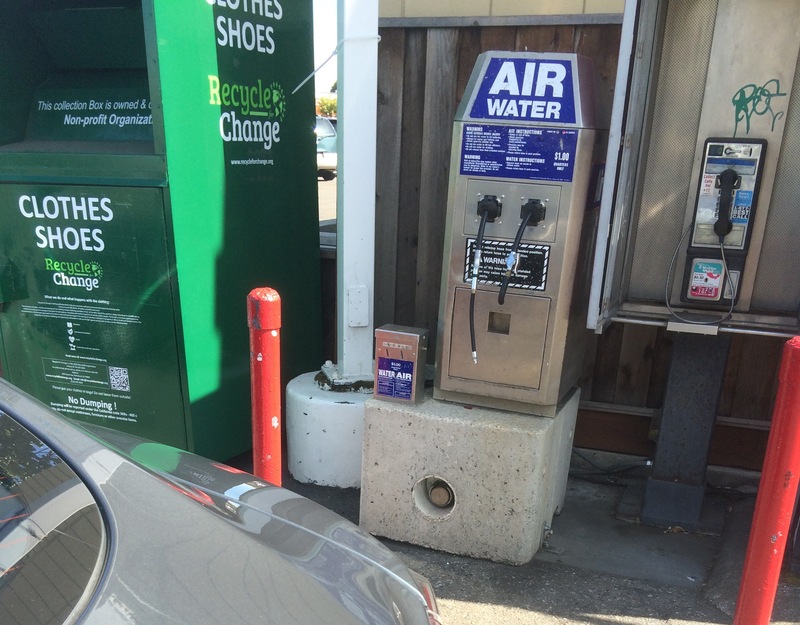 In the San Francisco Bay Area, many gas stations charge for air. I found the process to be a hassle dealing with a charge based machine. If the air was free, the process would be faster. I find this picture quite amusing. Not only are you buying air, which to me always feels ironic, you can use a pay phone to make a call at the same time. And if you are feeling generous, you can donate some clothes or shoes. 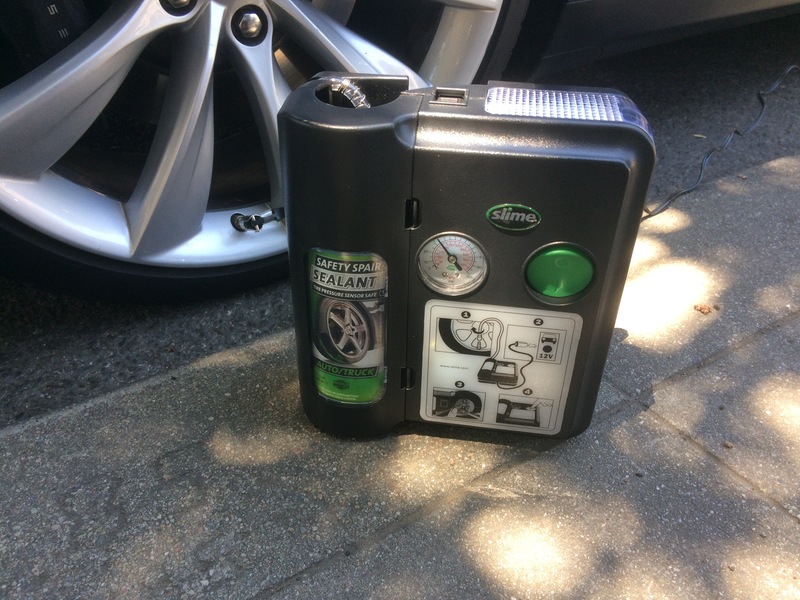 The second method is to use an electric pump that works on the 12V plug in the Tesla. I bought this kit online. It is not the Tesla branded version but it is the same basic kit. Using electricity it pumps air into your tire. The process is not particularly fast and your car needs to be unlocked to connect to the plug. I carry the pump with me in the car. The third method is to use a standing bicycle pump. This third method is my favorite method. When I’m in the garage without my key, I can pump up the tire at the same rate as the electrical plug using this pump. I also leave the pump near the car, and it helps to remind me to add some air. Most cyclists own one of these standing pumps and they cost under $50. 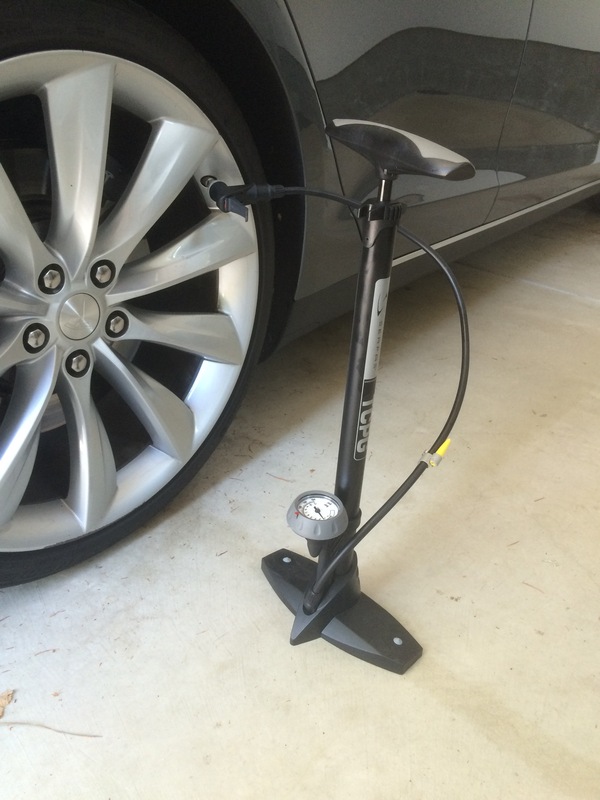 The standing pumps are much easier to use than the bicycle pump that you can carry on your bike. With any of these three methods, it takes about five minutes to add about 8-10psi to a tire. My car is going to Tesla soon and I’m likely going to buy at least two new tires. Topping off the tire every few days is pretty painless but I think I’m ready to be pump free.